Event Description : The Films and Theatre Society brings the tallest stalwarts of Nizami Qawaali in India – Nizami Bandhu, Bollywood’s most famous Qawwals, spearheaded by Chand Nizami, Sohrab Nizami, and Shadab Nizami and Nizami brothers, led by Ghulam Sabir Nizami and Ghulam Waris Nizami, together on stage. It will be an evening of finest Hindi, Urdu and Punjabi Qawwali by two of the biggest names in Sufi Qawwali Industry in India as of date. 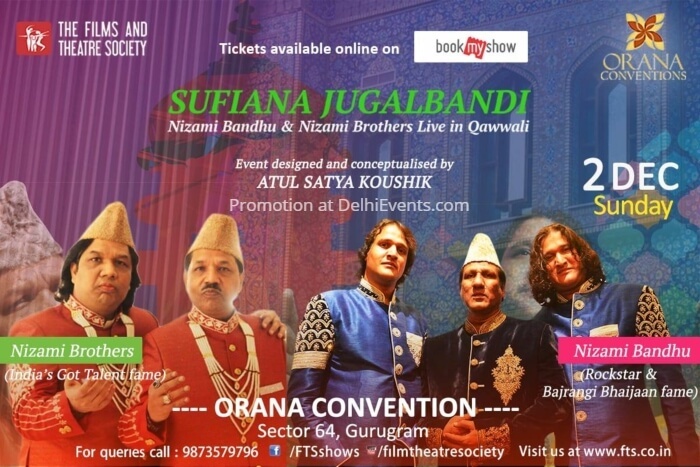 The Qawaali and Sufi music lovers in India will witness an evening of Jugalbandi, an evening of mutual appreciation and an evening of Ganga Jamuni Tehzeeb being presented in a Sufi musical way on stage.